Ready mixed, fiber reinforced, water repellent one coat white plaster. Suitable for interior and exterior use. 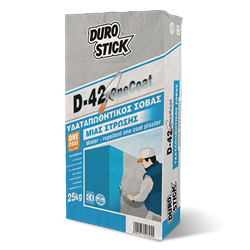 Replaces both steps of plastering, base and top coats, without bursting or cracking. Distinguished for its strong adhesion, resistance to moisture and frost. Maintains the breathability of all surfaces it is applied on. Colored in 24 permanent colors by adding pigments in powder form, Durocolor Powder-C into the mixing water of the product. Classified OC:CSIII/W1, per EN 998-1.